GY!BE - Allelujah! Don't Bend! Ascend! Home » Album Review » Godspeed You! Black Emperor – Allelujah! Don’t Bend! Ascend! That much maligned genre of music known as Post-Rock has shipped some heavy criticism in recent years. Mention Post-Rock to most music fan and images of serious young men playing lengthy instrumental pieces with pretentious song titles immediately spring to mind. The bands that have aligned themselves with this genre have done much to promote this stereotypical image by largely adhering closely to the Post-Rock manifesto, almost to the point of parody. Which is a shame really, because scratch beneath the surface, and you will find that some of the most inspiring and exciting music of the last 10 years has emerged from this scene. Bands like Mono, Explosions in the Sky, This Will Destroy You and our own God is an Astronaut have all produced superb albums that have stood the test of time and done much to promote the notion that Post-Rock has more to offer than the stereotypical image would have us believe. Canadian post –rockers Godspeed You! 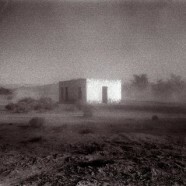 Black Emperor can justifiably lay claim to having been the most influential band of the past fifteen years in this genre. From the release of their debut album in 1997 to the announcement of an indefinite hiatus in 2003, GY!BE were right at the vanguard of the Post-Rock movement –their emotional, guitar driven instrumental music with a slight political edge set the benchmark for other bands operating in this field. Although many tried to imitate them, very few bands managed to hit the peaks of intensity they achieved on their seminal album Lift Your Skinny Fists Like Antennas to Heaven. Their reappearance as a live act in 2010 was warmly welcomed, and now with little or no fanfare, they have dropped Allelujah! Don’t Bend! Ascend!, their first album release since 2002. Twenty minute opener ‘Mladic’ immediately blows away any apprehension that GY!BE may have gone soft after such a long break – it is a thrilling, daring and explosive opener building from a low, ominous drone and some sampled voice snippets through a series of staggering peaks and mood shifts. ‘Their Helicopters’Sing’ is the first of two shorter pieces on the album built purely on layered, single note drones –there is not a whole lot else going on here, but it acts as something of a comedown after the exhilarating but exhausting opening track. ‘We Drift Like Worried Fire’ is classic Godspeed You! – a creepy circular riff builds and builds to a number of thrilling crescendos over the course of another twenty minute thrill ride. The album closes with another deeply unlovely eight minute piece of pure drone, but hey, when did GY!BE ever do lovely? With Allelujah! Don’t Bend! Ascend!, Godspeed You! Black Emperor demonstrate why they are held in such high regard and continue to set the standard in a genre that is in danger of becoming stale and unadventurous. While not an unqualified success, Allelujah! Don’t Bend! Ascend! is at times magnificent, scary, exciting , infuriating but never less than utterly compelling. A very welcome return.